The Earth cannot contain humanity’s ambition, and finally technology has afforded various corporations the opportunity of a lifetime: making Mars an inhabitable planet for Earth’s creatures. It’s a long road, and the project is far from cheap, but at the end of it all, when the conditions for habitability are met, you expect the awards to be heaped at your feet. And then won’t it all be worth it? 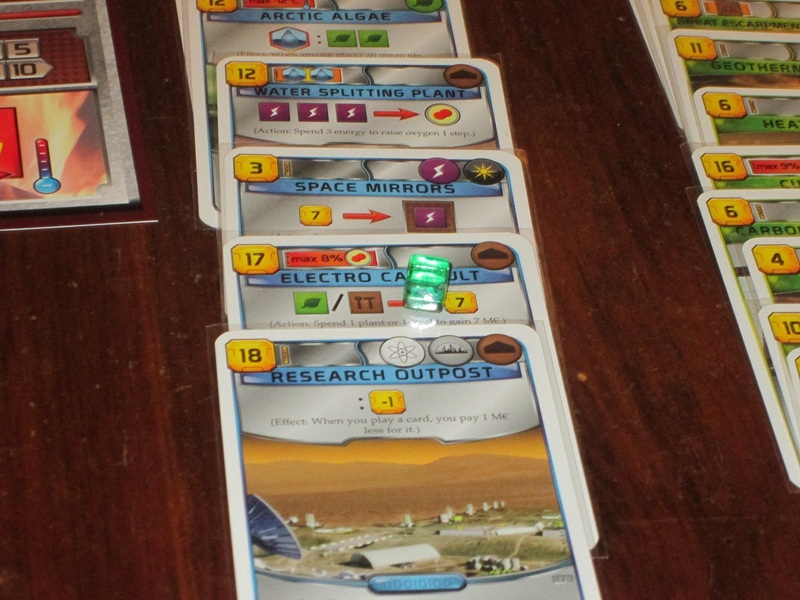 Terraforming Mars is a resource-management engine-building game for one to five players. Players represent corporations who are working to make Mars inhabitable. The game ends when the three global parameter minimums–oxygen, temperature, and oceans–have been met. The player who contributes the most to the terraforming effort is the winner. 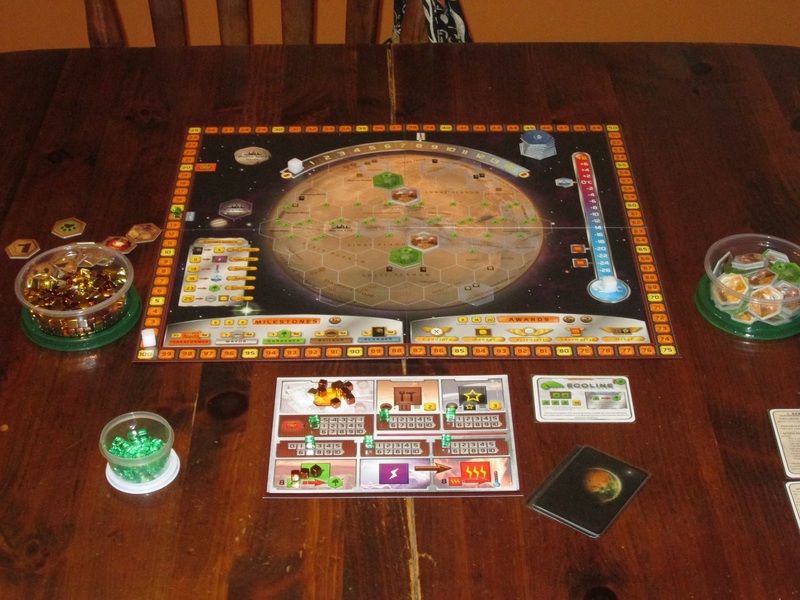 Terraforming Mars setup for one. To begin, the temperature and oxygen tracks begin at their lowest setting. Players receive a player board and all the cubes of one player color and place one cube on 20 on the terraform rating track and one cube on the 1 space of each production track. * Each player receives ten project cards and two choices of corporations. The player decides which cards to keep, purchasing project cards from the initial amount of Megacredits their chosen corporation provides. Players choose a first player, and play begins. Milestones give players another way to score points. Fulfilling the requirements can be competitive. All cards in the game have a cost in Megacredits, and the price of some cards can be reduced by steel and titanium resources. Most cards have tags that remain visible even after being played, and many of these tags interact with pieces of your engine to reduce costs, make you more efficient, or satisfy prerequisites. 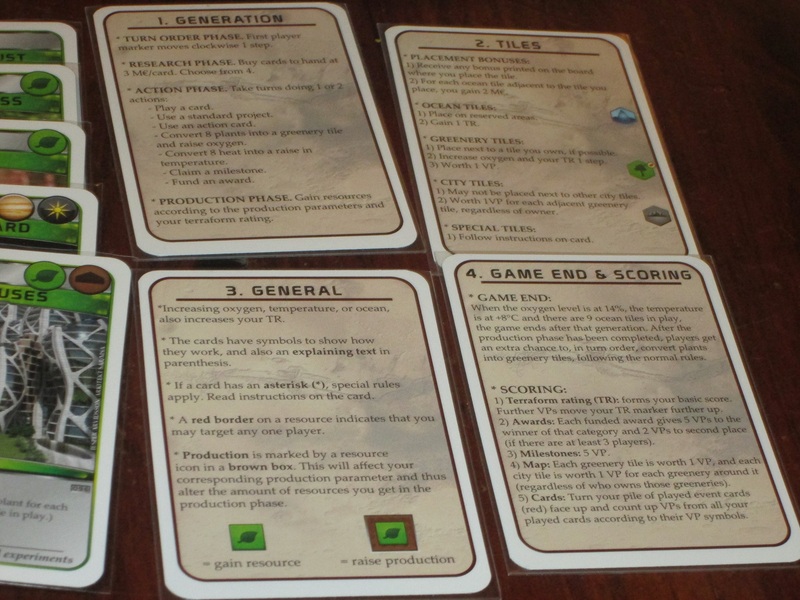 There are three kinds of project cards: one-shot events (turned face-down after play), one-shot “automated” green cards (whose tags remain visible), and permanent blue cards (which provide ongoing effects or actions for the player). Most cards provide resources or a permanent upgrade to the player’s production capacity or place tiles on the board that provide players points at the end of the game or other benefits. Every time a player in some way contributes to meeting the global parameters of oxygen, temperature, or oceans, that player’s terraforming rating goes up by 1. 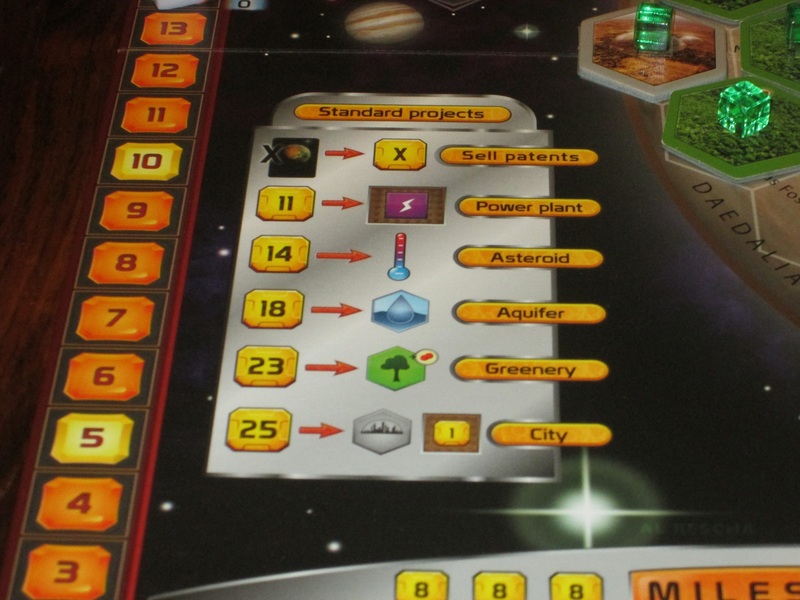 Once all players have passed, players convert all of their stored energy to heat and then produce resources according to their player boards and terraform rating. The first player marker passes, and each player receives four cards from the deck, which they can either buy or discard, and a new generation begins. The game ends at the end of the generation once all three global parameters are met. Players add together their terraform rating, points for their tiles on the board, points for their awards and milestones, and points on their cards. The player with the most points wins. * Note: There are several variant ways to play. I’m describing the basic rules with the advanced corporations. There are also basic corporations, the Corporate Age expansion, drafting rules, and a solo variant that change the rules somewhat. My relationship with Terraforming Mars is kind of like that. And just as we can’t always understand the ways of the heart when it comes to our friends’ dating decisions, I can’t fully understand why, despite its flaws and our frequent fights, I keep wanting to play Terraforming Mars. At the start of the game, each player can choose between two corporations that provide a permanent ability as well as starting income/production. Each of these is unique, and each really does provide different flavor to the game. I’ll start with theme, which is an odd place to begin for a Euro game, but, again, we’re in strange relationship territory here. And the amazing thing about Terraforming Mars is that it has a thematic backdrop that fits. In fact, it’s so well integrated into the game that this game couldn’t really be about anything else without significantly overhauling the gameplay. Yet for all its ties to the theme, Terraforming Mars is not a simulation. It’s a fun game that is firmly situated in a story, and players are participants in the story, and the game tells the story using Euro mechanisms. It’s weird, but it works. In fact, this is one reason why I think Terraforming Mars has been attracting the attention it has: it’s something we Euro players can show our theme-loving friends, and their faces won’t melt off in boredom. 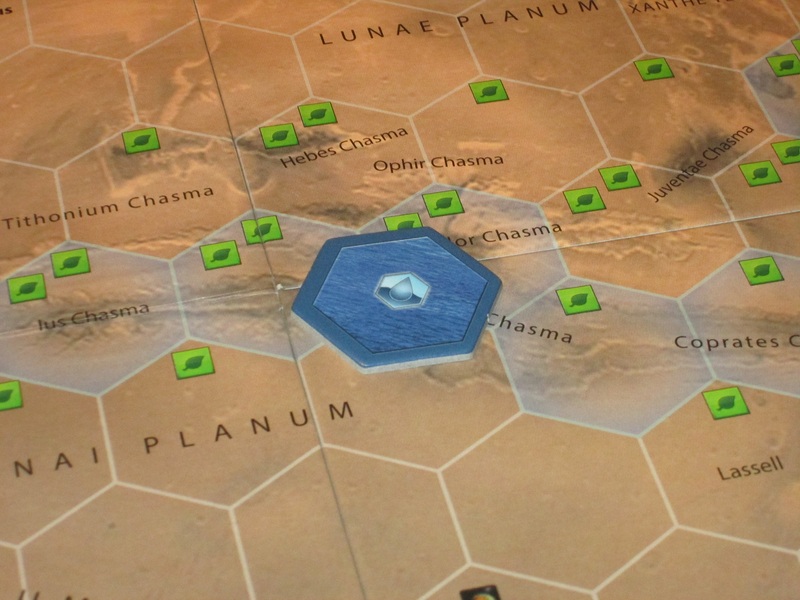 The player mat in Terraforming Mars. This tracks production as well as how many of each resource you have. I mentioned that the game has a narrative arc to it, and contributing to this feeling of progression is the engine-building nature of the game. 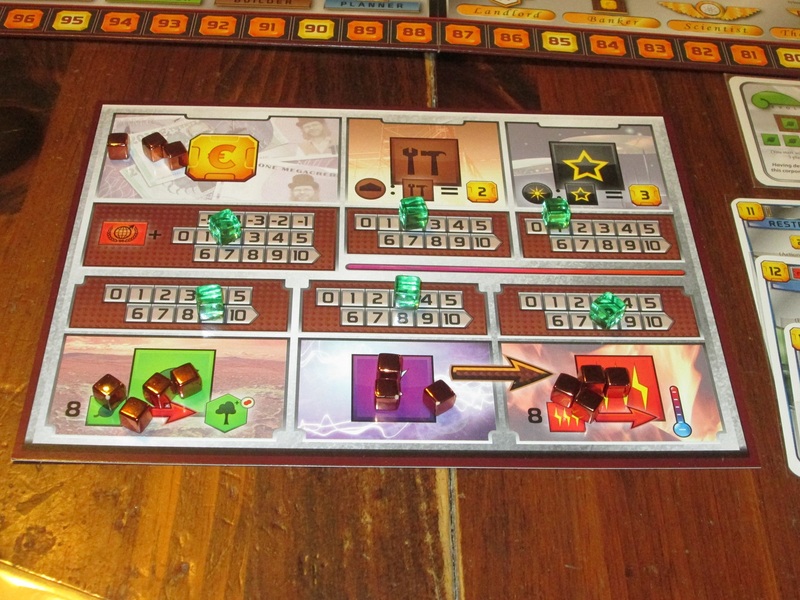 You arrive on Mars as a corporation with just a dream and some starting capital, but as the game goes on, you begin to feel the growth of your corporate empire. The initial generations are short, with players planning much and availing little, but later generations see players making sweeping changes to the Martian landscape in one go as they crash asteroids (or moons! ), mine deeper, explore further, and discover new technologies that are better suited to the harsh environment of a new planet. 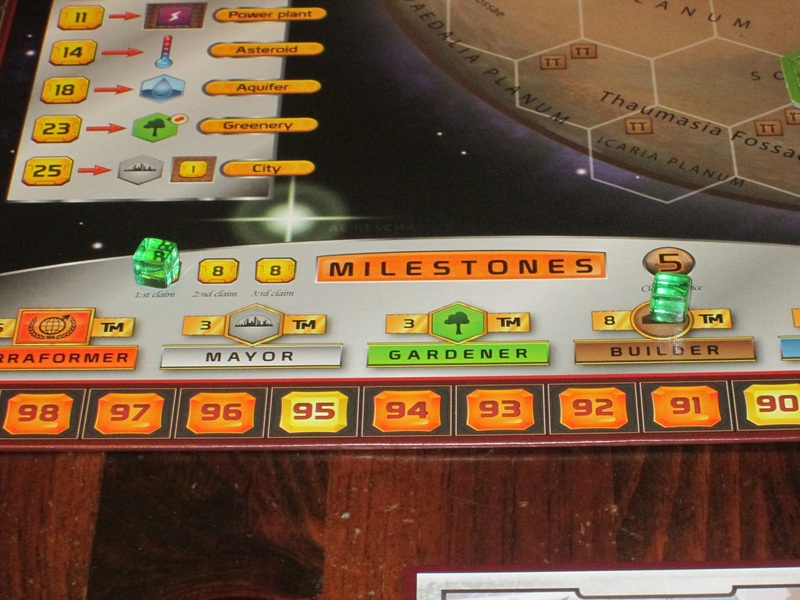 Similar to building a farm in Agricola, it is satisfying to survey the board at the end of the game and see just how much you contributed to the now colonizable (albeit still somewhat inhospitable) planet of Mars. Oceans have to be placed on the spaces reserved for them. Oceans provide a benefit when tiles are placed adjacent to them, and the board provides bonuses in certain places where tiles are placed. Adding to the narrative arc are the unique player corporations. There are 12 in the box, and each player receives two at the start of the game to choose from. Player corporations are asymmetrical, offering each player a different amount of starting capital, a different persistent ability, and different card tags. Generally asymmetrical abilities are not my favorite, but here each of the corporations seems balanced, and the narrative weight they lend to the game is worth any difference in fairness. (Of course, you may choose a corporation that’s good at one thing and not draw the cards that play to your strengths–you have to accept the good with the bad.) The basic game offers players the option of choosing standard corporations, which have no asymmetric abilities and don’t require players to buy their starting hand, but I think these are bland, and even with new players, I throw in the advanced corporations. 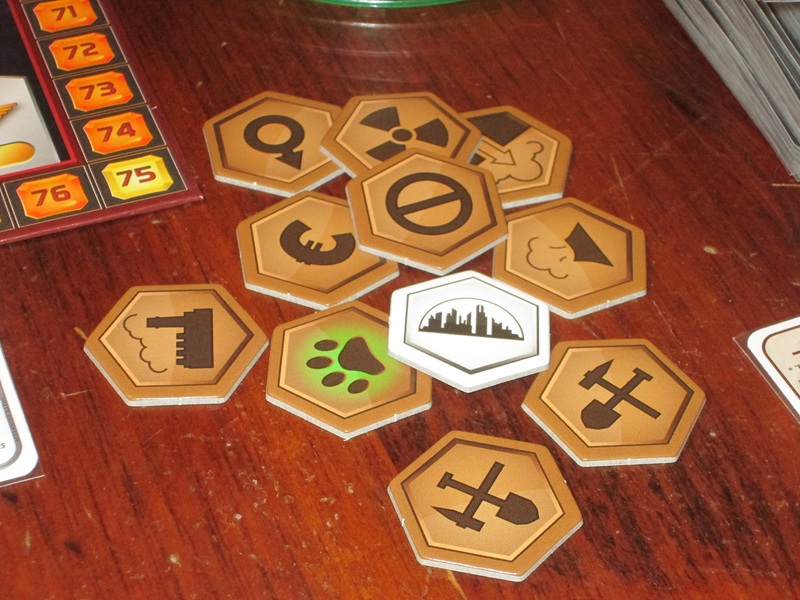 Special tiles allow players to mark on the board where special events have happened (for example, dropping nukes). The corporations are just one of the many ways the designer has provided options for customization to the game. In addition to this, there’s a Corporate Age expansion (where players start all of their production tracks at 0 but there are more cards for small steps forward in production), a drafting variant, a solo game, and more. The game invites players to tailor the game to their preferences, which is probably also responsible for the huge amount of praise Terraforming Mars has garnered: there’s something to like here, really, for everyone. And aside from the options for customization at the start of the game, each player is encouraged to customize their own path for terraforming Mars. The corporations go a long way here, but most of the project deck is unique, too, meaning that the projects I use for terraforming Mars are likely different from my opponents’. I might contribute a lot to raising Mars’ heat while they are working on oxygen or oceans. Players are chipping away at these parameters on their own, but in the background, all players are trying to help (if not just to get a higher terraform rating, which is responsible for both making players richer during the game and winning them the game). There are lots of opportunities for players to experiment and find combos and otherwise feel clever about the way they go about things. Terraforming Mars is a satisfying game to play because of this. Blue cards provide permanent effects, some of which can be used once per round as an action. I also love the tension inherent in choosing cards–deciding in advance which projects I’m going to pursue when I might not get the resources I need to see them completed. Card draws are hard to come by, so you want to buy every card you can. But the game rewards efficiency: you have to spend your resources wisely in order to accomplish what you need to, and if you later decide you want to ditch some of your cards because they didn’t turn out to be as useful as you thought, you get only a partial rebate and you have to use an action to turn in your cards. The resource management and conversion puzzle is a fun one, aided by the metallic cubes, which represent every resource from Megacredits to heat. These cubes reinforce the idea that resources are fluid, malleable to whatever plans your mind can devise. Green cards provide tags after use that help players meet prerequisites or increase the efficiency of their corporations. 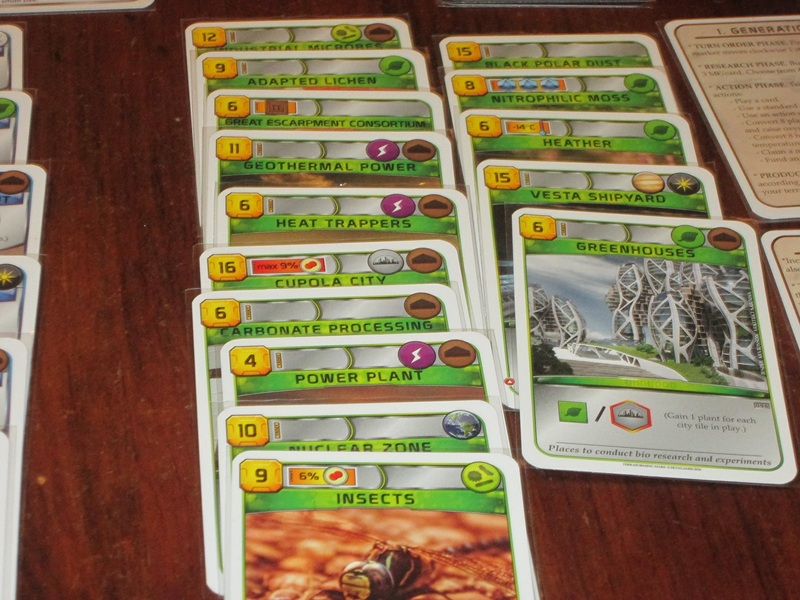 One of the best values of Terraforming Mars is the solitaire game, which is far from bolted on. 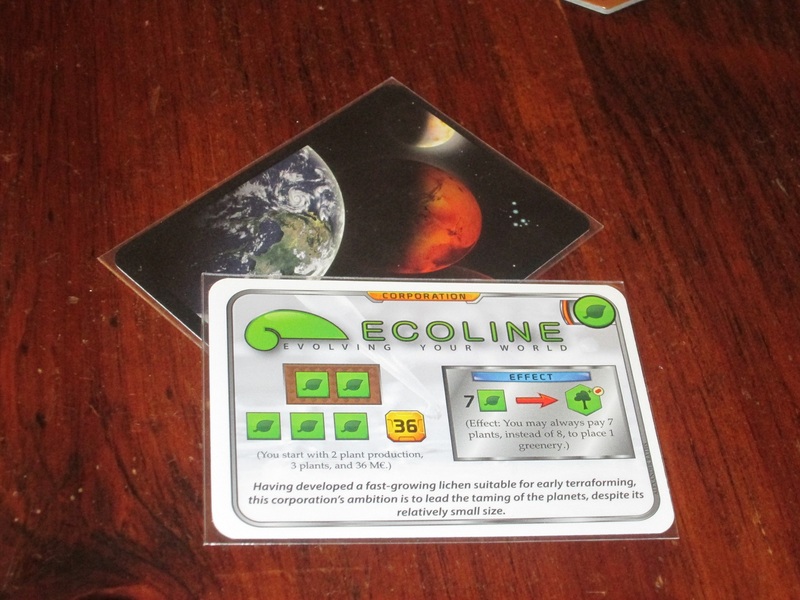 In the solitaire game, you use the Corporate Era expansion and have just fourteen generations to terraform Mars by yourself. The solitaire game strikes the right balance between being challenging and offering hope. Even with a poor first few generations, you know that there are still a number of generations left, and you just…might…crawl across the finish line. In most games–even ones that seemed dire from the beginning–I can look back and see how I could have done something differently, which means that the game rewards skill. Of course there is luck in the game, especially in the huge project deck, only some of which you will see each game. But some trade-off of luck for replayability and new challenges seems worth it here. The solo game clocks in consistently at 50 minutes, which is just the right length for it to feel somewhat epic while not removing you fully from the duties of life and home. The solitaire game, in my opinion, is a huge selling point here, if not worth the price of admission on its own. Standard projects are always available. These aren’t the most efficient way to get things done, but they’re always an option. 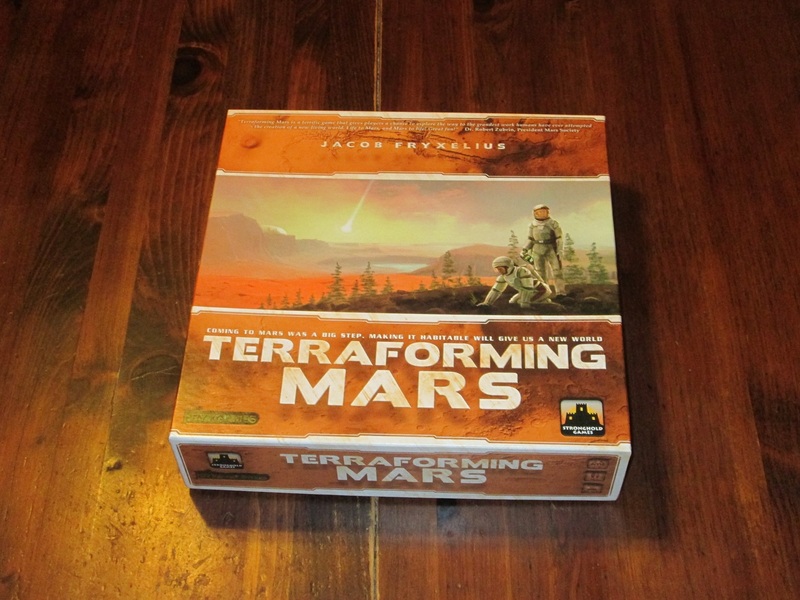 So with all this praise, why can’t I give Terraforming Mars a fully ringing endorsement? Why are we the feuding couple constantly at odds with each other? The first issue is that the game, while incredibly interesting on your turn, is much less interesting on other players’ turns. 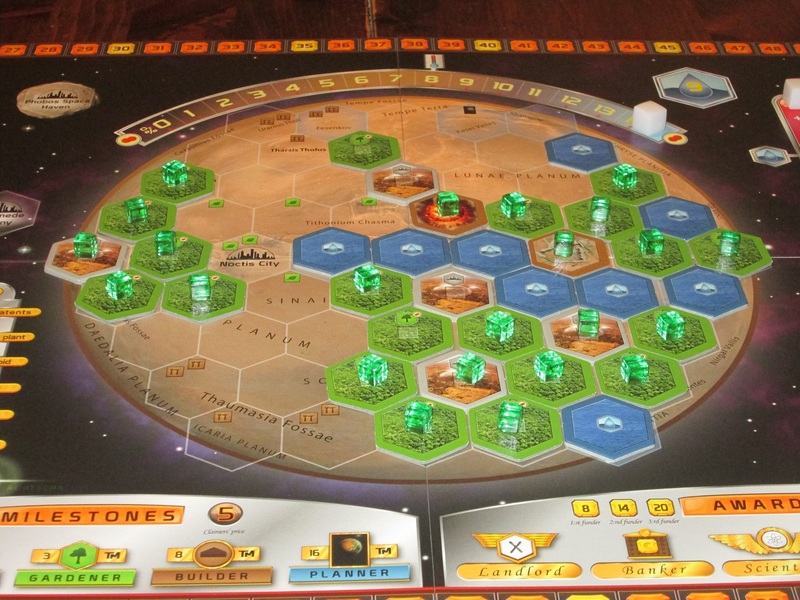 Unlike a game like, say, Imperial or Terra Mystica, where I can stare at the board completely engrossed when it isn’t my turn as I scheme my next move (especially because the board state is constantly changing), in Terraforming Mars, because much of the gameplay is so solitary–focused on my engine and how I’m going to make my resources stretch–I’m mostly just waiting for it to be my turn again and wishing the other players would hurry up. While other players’ actions do affect the game state, and there are milestones and awards to encourage interaction, these things don’t affect the game enough to derail my plans in most instances. So if another player is moving slowly, it makes the game drag. I’m reminded of an observation a friend of mine made while we were playing Deus. “We keep announcing our actions because otherwise no one’s paying attention.” Terraforming Mars is an “announcing your actions” kind of game that needs to be played quickly because the individual puzzle, while interesting, is not engrossing enough to hold my attention while other players plan. Some of this downtime is lessened by playing with experienced players, but much of it is inherent to the game as resources are so scant. Certain spaces in the global parameters act as combos, giving players additional benefits for reaching them. But the strange corollary to this is that while the game is, on one hand, not super interactive, there is the presence of take-that elements that just don’t fit all that well. For most of the game, while it’s worthwhile to pay attention to the other players, it’s not necessary to give your full attention. And then out of the blue, someone will announce, “Oh yeah, and I’m destroying your plants.” ?!?! Terraforming Mars seems to be a solitary game of rivaling corporations making their plans and only kind of cooperating to make Mars inhabitable; then suddenly you discover that the delicate plants you’ve been carefully cultivating have been destroyed by a not-so-rogue asteroid. Oops. The solo board a little under 75% of the game through. How will I ever terraform Mars at this rate?! While these take-that elements do make some thematic sense (it makes sense that plants would be the most fragile resource in a hostile environment), they don’t make much sense from a gameplay standpoint. Perhaps they balance the game. All I know is that after I play, I’m upset to have been the target of these attacks when I had grand plans that were foiled and was given no way to retaliate. It is that much more cause for sour grapes when I can point to an exact moment when the points I needed to win were stripped from me through asteroids or predators and there’s nothing I could have done to combat it. The finished game. I made it! Somehow! One of the exciting elements of this game is how your engine gets better and better as the game goes along, making it possible to win the solitaire game even with a slow start. There is also some luck present in the game, especially in the non-drafting standard version of the game (and the game takes long enough that I would never add the extra time a draft requires). Players get to see ten cards at the beginning of the game and four cards per generation and then buy the useful ones to their hands. So far so good. However, luck can make game draws uneven. Perhaps you draw a card late in the game after you’ve already passed the maximum requirement, effectively limiting your options through no fault of your own. The luck in the game is at times annoying, and while I’m usually not in favor of strong luck elements, it doesn’t bother me as much in Terraforming Mars. I expect in some way to be grappling with a hostile environment, and I see these failed projects as trial-and-error failures. So luck, while occasionally bothersome, isn’t even much of an issue for me, although it will be for some players. The player aids are helpful, but there are only two sets included in the game, and they are single-sided. Seems like a missed opportunity. 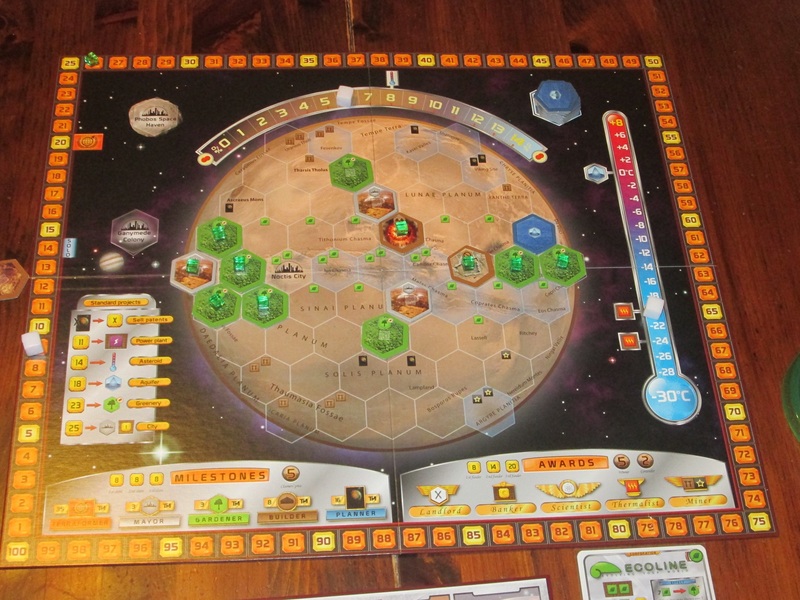 Rather, for the previous reasons–downtime, low interaction, and what interaction is present being negative–I prefer Terraforming Mars as a solo game. In fact, I will go so far as to say that it is a superb solitaire game, while the multiplayer game, while better than many, is not great enough to oust the classics from my rotation. And the solitaire game is tough. Because the solitaire game necessarily uses the Corporate Age expansion–which requires starting production, essentially, from scratch–and lasts only fourteen generations, there’s very little room for mistakes. I think I’ve won the solitaire game only slightly more times than I’ve lost, and yet the puzzle of it and the variety of the cards is interesting enough that I keep coming back for more. The sheer variety of the corporations and the project deck ensures that the game never plays the same way twice (you can’t hold out for the one card that would be perfect), and the narrative satisfaction of arriving on a barren planet and having it fully (or almost fully) terraformed is unequalled by all but the best solitaire games. (Robinson Crusoe is the only one that rivals it in my mind.) The solitaire game also has the right pacing, keeping players in suspense usually until the very end whether they’ll complete the terraforming at all, and consistently lasts a satisfying 50 minutes. So while I might sell or trade Terraforming Mars if all I had was the multiplayer experience, I keep it on my shelf because of the solitaire mode. But the strange thing is that even as I recognize the “flaws” (as I see them) in multiplayer, I still want to play it with others. I recognize the apparent contradiction here, and I have no idea how to explain it. Which is why I began this review by talking about matters of the heart, where logic is less important than desire. The resource cubes. These have a cool metallic plating. One corner is undipped (like Achilles’ heel) because of the production process, but these are a fun way to represent resources. Terraforming Mars has a hefty rulebook, but most of the rules are straightforward because the thematic tie-in is strong. The tough thing is making the right decisions. The included player aids are a boon for teaching, but there are only two copies of each, which seems like a missed opportunity. (Printing them double-sided might have helped.) The components in Terraforming Mars are mostly good. 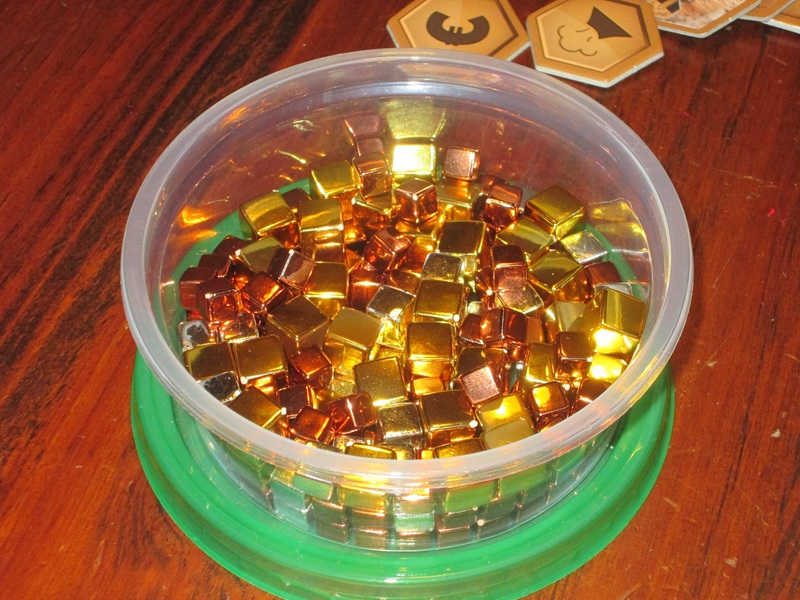 I like the translucent player cubes, and I think the metallic resources are very cool, even if the production process leaves one corner of each cube uncovered. The graphic design of the game is clear and serves as an aid to players for what they can do. The player boards are thin–the constant complaint–and while they’re playable as-is, I did invest in a third-party mat solution that works much better. The tiles are thick and of excellent quality, and the cards are also nice quality, although the art on them is…a mixed bag. Some of the illustrations are very attractive, others less so, and others are photographs. I don’t care for this melding of styles much, but I was more forgiving when I read the designer’s explanation that the look is intended to mimic science magazines. Fair enough. And really, I’m not concentrating on the illustrations; I’m looking at card abilities, and here, as on the board, the graphic design is clear. The package altogether isn’t bad until you consider the price tag. I realize that games are more than their components, and there was clearly a lot of design work that went into making this game what it is, including lots of research into potential future technologies that would aid in making Mars inhabitable. But the fact of the matter is that when comparing Terraforming Mars to other games at a similar MSRP, it looks a little shabby. For me, I bought this online at a discount, and I don’t regret the price I paid (around $50). I don’t think I would have paid MSRP and been a happy customer. But of course, price is one thing; value is for each person to decide. 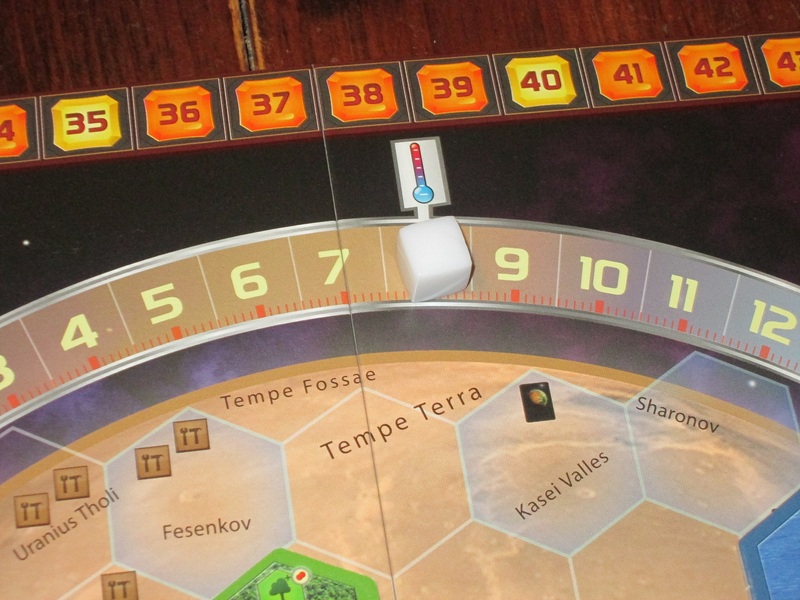 Terraforming Mars is much greater than the sum of its parts. While I dislike the level of player interaction (by turns live and let live and take that), the downtime, and the depth-to-time ratio, Terraforming Mars is unquestionably a game I want to keep playing. I think the solo variant is one of the–if not the–best in the business, and even the multiplayer game hasn’t made me remove it from the rotation. There are some odd component choices, and some may question whether the game is worth the price, but for me, after twenty or so plays (solitaire and otherwise), I’ve more than gotten my money’s worth on my voyages to Mars, and I plan to embark on many more in the days to come. I’m intrigued by the theme and the tight resource management. However, the fact that you say there is an outstanding solitaire game is a huge plus for me when buying something. In a household of two like mine, working on different shifts, that lets me get a lot more bang for my buck. I’ve been curious about this game for a long time and I think I may just take the plunge! It’s not too expensive on Amazon these days.